In negotiations after the conflict of Dubrovnik with Russia 1764 to 1775 Russian government requested from Dubrovnik to accept a Russian consul who would have a right to build an Orthodox Christian Church in Dubrovnik. Dubrovnik government denied the request with explanation that on their territory there is only a few Orthodox ("greek") families and have allowed the consul to arrange for a small chapel in his own residence. Later, instead, an Orthodox chapel was built outside the City walls on Boninovo (the site of Dubrovnik cemetery). From the reports of emissary Ranjina we find the reasoning behind denial of building of an Orthodox Christian Church in Dubrovnik. His report tells how if an Orthodox church would had been built in Dubrovnik in a very few years Dubrovnik would be settled by many thousands of Orthodox Christians from regions under Venetian and Ottoman control. Those people would still remain to be subjects of their respective rulers and in a short time those people would by their sheer numbers seize control of Dubrovnik and Dubrovnik Republic would seize to be what it was. According to the decision of Dubrovnik Senate Orthodox Christian priest could come to Dubrovnik twice in a year and spend at most 8 days in Dubrovnik. Only in 1813 did the Orthodox Christian inhabitants of Dubrovnik gain a citizen status in Dubrovnik. Before that they were considered only as subjects of the Ottoman empire. As the political situation changed in 1839 the Guardian council of the Orthodox church started searching for a suitable site for building an Orthodox church in Dubrovnik which would replace the already existing chapel on Boninovo. With this intent in 1865 they purchased the Gucetic theatre from brothers Boskovic and ordered a project from the architect Vechetti. However when the building project started in 1868 it was realized that the parcel was to small for the planned project. The council, therefore, purchased the Renaissance Gundulic palace and the palace Stay, Gundulic's baroque garden with the southern approach and two buildings next to the Ulica od Puca (in translation - Street of Wells). For the realization of the project the two buildings next to the Ulica od Puca street were demolished, as well as the baroque wing part of Gundulic palace, the garden, and the approach. 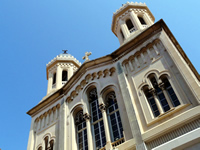 The building of the Orthodox Christian church started in 1871 and already in 1877 the church was consecrated. However the final works on the building continued to the early 20th century. Orthodox Christian Church in Dubrovnik is a single nave structure with a semicircular apse and two octagonal belfries. Church is oriented towards the Ulica of Puca street. The church is built in ornamental neo-byzantine style and stands out from the surrounding architecture with its overextending space usurpation and raised plateau position. In 1907 the Orthodox church also purchases the neighboring Bundic palace (the family Bundic is also known as Bonda) and a small baroque Chapel of the Annunciation. In lieu of the chapel a small building that houses offices of the Orthodox church is erected. Today the Bundic palace hosts the Museum of Icons. The exhibits at the museum include valuable icons from the period between the 15th and 19th century, portraits - some of which were painted by the famous painter Vlaho Bukovac -, valuable pieces of furniture, and interesting artifacts such as the facsimile edition of the Gospel by St Miroslav and the Russian printed Gospel in a metal cover. According the 2001 census there are 1697 Orthodox Christians living in Dubrovnik.